Just played Bandon Dunes golf course this weekend. It's a goddamn beautiful course. It's been called golf as it was meant to be, but nothing's pure in life, I've decided. But it's the closest thing to it. On the ninth hole, we spotted some wild pheasants resting in the gorse. Bill and I circled around the back, inch by inch, all the while watching the wind direction. We got close enough to take our 8 irons to a few of them. Bloody mess. Knocked the head of one of them thirty yards. Ken had no stomach for it. I hadn't played much golf this year, but I made up for it over the weekend. As Bill and I arrived at the airport at North Bend on Friday (a single gate in a structure the size of Bill Gates's outhouse), I called the course to see if any tee times had opened up on Pacific Dunes. We were in luck. I grabbed the next available tee time on Pacific for that afternoon, and I also put us down for another round on Pacific the next morning, before a previously scheduled round at Bandon Dunes at 12:30. Our room wasn't even ready yet. Bill and I just headed straight to the course from the airplane and teed off. 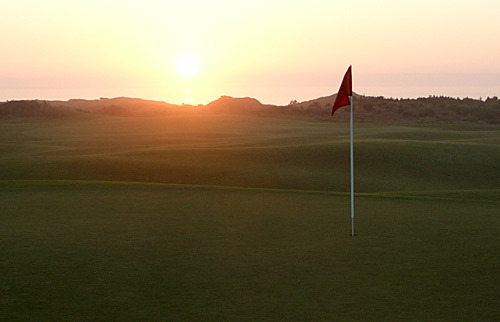 The Tom Doake-designed Pacific is more difficult than David McLay Kidd's Bandon. The fairways and greens are tighter, and it's more like target golf. Low handicappers tend to favor Pacific. 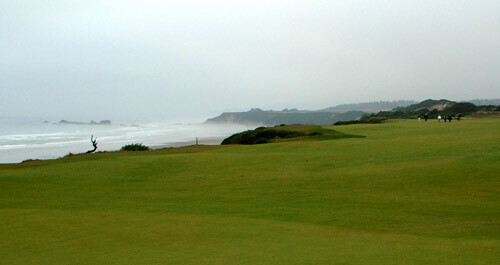 The course has a longer stretch of holes along the ocean. My golf swing was rusty and felt alien to me. I stood over every ball confused and expecting the worse, and I shot my worst round in years. Saturday morning, Ken, Bill, and I were the first group sent out at Pacific Dunes. We arrived at the course in near darkness just after 6:30 in the morning, and as soon as enough light diffused through the cloud cover, we teed off, at around 7:20am. My swing was still nowhere to be found, though it wasn't nearly as disastrous as the previous afternoon. Ken was driving everything straight down the heart of the fairway. In the early morning fog, the course felt mysterious, gothic. We could have been in Scotland, and standing over one of my many disaster recovery shots amidst patches of gorse, I half expected Will Smith as Bagger Vance to suddenly appear in a dark brown suit and top hat and say, "I hear you lost your swing. I guess we got to go find it." One of the great things about Bandon is that they encourage ready golf and push for a pace of 4 hrs 20 minutes a round. And they receive it. We finished our round in four hours and headed straight over to Bandon Dunes for a second eighteen. The sun was out by then, transforming the course again. They've taken the fangs out of Bandon since last year. They cut back the gorse (a nasty, thorny bush that swallows golf balls whole) on either side of the fairways, widening already wide landing areas on most holes. 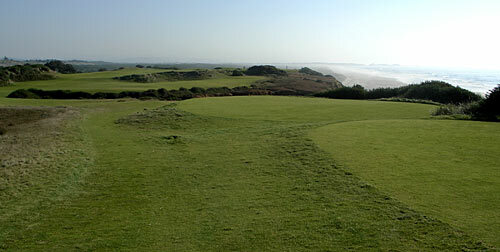 It's a great course for creative links-style play, though, especially when the wind is gusting. You can use your imagination and approach every whole in a variety of ways. The greens roll as true as any greens I've played anywhere, and the course always plays fair. We finished our second round at about 5:30pm. I could barely walk. At Bandon, your first round of a day is full price, your second round is half price, and your third round is free. Since we'd already played two rounds that day, any additional holes we played would be free. There's not a whole lot else to do there, and who could turn down free golf on a course as beautiful as Bandon on a glorious day? Bill's caddy Dale did a double take. "You're headed out again? You guys are crazy." This from a guy who said he was half blind in one eye because his brother had dropped a slab of concrete on his head while horsing around when they were young. We were the first ones out that morning, and we were the last ones to tee off that evening. We could hardly walk, but having that entire course to ourselves was magic. The course had changed yet again, framed by the searing orange of the setting sun. 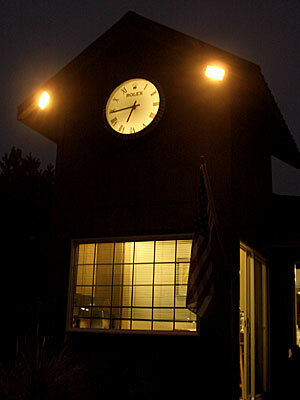 We staggered to the ninth hole and finished in the murky gray of twilight. 45 holes of golf in one day, the most I'd ever played in a single day. We sat outside of Mulligan's Pub by an outdoor fireplace, slumped in our chairs like soldiers returned from war, feet aching. A few glasses of the Rogue beer brewed especially for Bandon Dunes restored our energy. Sunday we had planned on another 25 holes of golf: 18 at Bandon and the 7 just-opened-that-weekend holes at Bandon Trails, the new Ben Crenshaw/Bill Coore designed course that's set to open next year. Unfortunately, Bandon Trails wasn't open on Sunday so we'll have to challenge it next year. I birdied the second hold on Sunday, a par 3 that played about 170, but it was Bill who was the story. By hole three, when he hit his approach shot, Ken and I looked at each other and made the "whooo-eee" expression. Bill was in that happy place athletes call the zone. We're not professionals, so it wasn't that he was assaulting every flag stick, but he was just rock steady, consistent from tee to green. On the back nine, I found my swing for a stretch and stayed with Bill for about five holes, all pars and bogeys, but the last few holes he lost me. After the round, Ken and I tallied the score and asked Bill what he thought he had shot. He said 84. We showed him the scorecard, which we had autographed for him. He had shot a career-best 81. I carded a 91. I think I'm a good luck charm. I was there with Robert when he shot a 73, just barely missing a putt for par, at Washington National. I think I carded a 91 that day also. 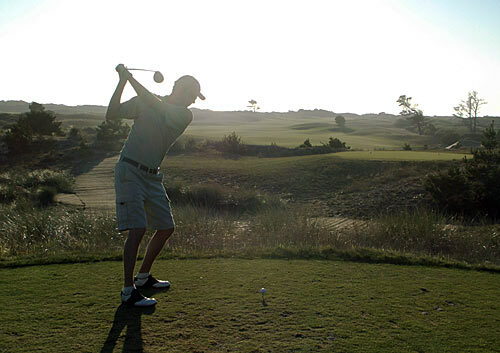 Pacific and Bandon rank #2 and #7 in Golf Magazine's 2004 Top 100 Courses You Can Play. Pebble Beach is #1, but at a cost of $395 to $420 a round, it's not a better value. I'll have to try Bethpage (Black) which is ranked #3 and is in Farmingdale, NY. I played Torrey Pines (South) in June, and it doesn't compare to Bandon or Pacific. For golf purists, Bandon Dunes may be the premier single destination in the U.S., especially once all eighteen holes of Bandon Trails open next year.